I’m often asked what I eat for breakfast. 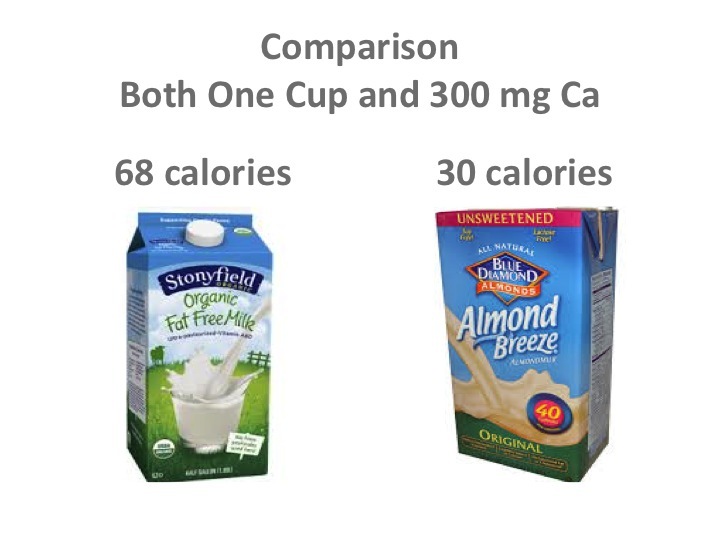 For many of us, it’s hard to imagine starting the day without meat, dairy or eggs. Turns out there are many wonderful non-dairy yogurts and cream cheeses on the market. My favorites are two superb products from Kite Hill: an almond-based yogurt and a chive cream cheese. I also love Miyoko’s Kitchen nut-based cheeses. Avocado Toast: This is a family favorite especially made with fiber-rich sprouted grain Ezekial Bread. If you are not a fan of raw onions, skip them in the recipe. It will still be yummy! 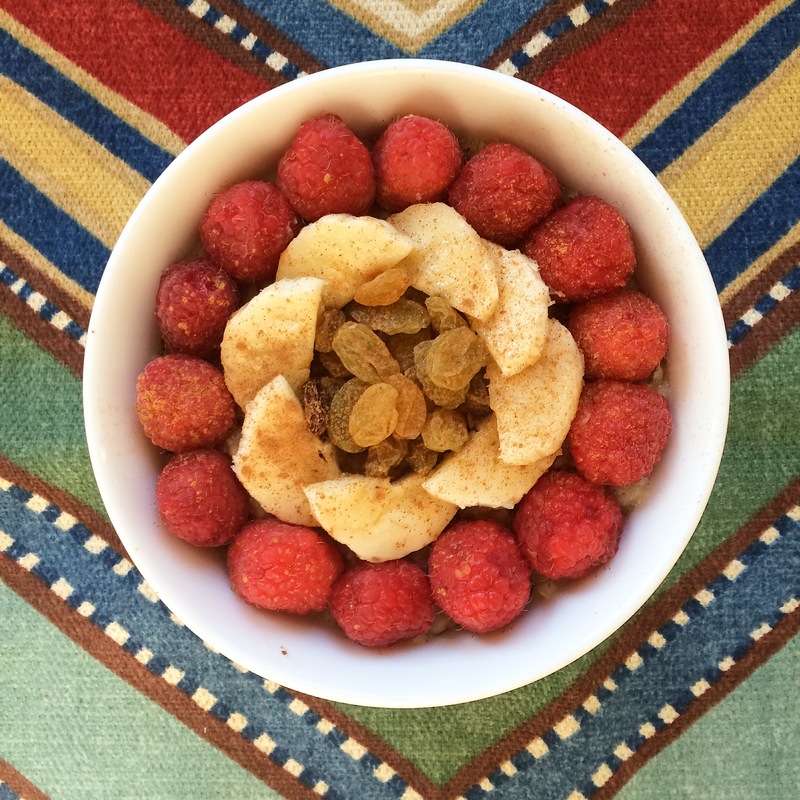 Creamy Raspberry-Banana Oatmeal Bowl: A bowl of whole grain oats is a perfect way to start the day especially if you are trying to prevent or address heart disease. They contain a cholesterol lowering fiber compound and help to keep blood sugar levels under control. Cinnamon Rolled Oats: In addition to oats, this simple-to-prepare breakfast dish contains cinnamon and ground flax seed. Cinnamon is great source of antioxidants. Flax seeds are an excellent source of omega-3 fatty acids, iron, zinc, calcium, protein, potassium, magnesium, folate and soluble fiber. Tofu Scramble: Crumbled tofu makes for an excellent scrambled egg-replacer. Tofu is a rich source of protein, omega-3 fatty acids, iron, isoflavines and calcium (if prepared with calcium sulfate). Tempeh Hash: A traditional Indonesian staple, tempeh is made from fermented soybeans. It is rich in fiber and protein and has a delicious nutty and chewy flavor and serves as a great meat substitute. Oat and Chia Parfait Chia seeds are considered super-foods and are packed with protein, antioxidants, fiber and omega–3 fatty acids. Acai Bowl: Studies show that acai berries are amongst the most antioxidant rich foods ever tested. Green smoothie: This sweet and flavorful smoothie is packed with kale, a health promoting, calcium, antioxidant and phytonutrient rich leafy green. Chickpea Omelette: This is a simple-to-prepare egg-free “omelette”. I like to sautee a mix of vegetables (e.g.onions, peppers, mushrooms, tomatoes, kale, spinach, etc. in the pan) first and then remove them and set aside. Once the omelette is cooked on both sides, I place the veggies on one half and fold the veggies over it. Chickpea flour is also known as garbanzo flour or besan and is a high fiber, gluten free staple of many Asian cuisines. Chia Pudding: So simple and easy to prepare. This pudding has three ingredients: chia seeds, almond milk and maple syrup. 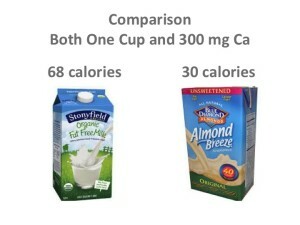 Compared to skim milk, almond milk is relatively low in calories and contains just as much calcium. Banana Chocolate Chip Pancakes: My favorite flour for this recipe is a Whole Wheat Pastry Flour. The whole wheat berries in this flour are milled with the nutritious bran, endosperm and grain of the soft white wheat kept in tact. It provides a good source of fiber and protein and provides a baked good with a light texture. I use it as a 1:1 replacement for all-purpose flour whenever baking with baking soda or powder as leavening. It doesn’t work as well with yeast –risen baked goods. Blueberry Oatmeal Waffles: Berries are among the healthiest fruits and have a high antioxidant and phytonutrient value. They have been associated with improved memory, delayed cognitive aging and protection against age-related macular degeneration. Additionally, they may lower cancer risk. Questions or comments…send them my way. Always happy to hear from you!